Forecasting political unrest is a challenging task, especially in this era of post-truth and opinion polls. Several studies by economists such as Paul Collier and Anke Hoeffler in 1998 and 2002 describe how economic indicators, such as slow income growth and natural resource dependence, can explain political upheaval. More specifically, low per capita income has been a significant trigger of civil unrest. Economists James Fearon and David Laitin have also followed this hypothesis, showing how specific factors played an important role in Chad, Sudan, and Somalia in outbreaks of political violence. According to the International Country Risk Guide index, the internal political stability of Sudan fell by 15% in 2014, compared to the previous year. This decrease was after a reduction of its per capita income growth rate from 12% in 2012 to 2% in 2013. By contrast, when the income per capita growth increased in 1997 compared to 1996, the score for political stability in Sudan increased by more than 100% in 1998. Political stability across any given year seems to be a function of income growth in the previous one. Usual economic performance indicators, such as gross domestic product, trade, and foreign direct investment, showed higher economic development and globalization of the Arab Spring countries over a decade. Yet, in 2010, the region witnessed unprecedented uprisings that caused the collapse of regimes such as those in Tunisia, Egypt, and Libya. In our 2016 study we used data for more than 100 countries for the 1984–2012 period. We wanted to look at criteria other than economics to better understand the rise of political upheavals. We found out and quantified how corruption is a destabilizing factor when youth (15-24 years old) exceeds 20% of the adult population. Let’s examine the two main components of the study: demographics and corruption. The importance of demographics and its impact on political stability has been studied for years. In his 1996 book, The Clash of Civilizations and the Remaking of World Order, United States academic Samuel P. Huntington explained how youth are agents of change. Several examples can be found throughout the early 2000s. Young people were particularly active in Yugoslavia’s Bulldozer Revolution (2000), Georgia’s Rose Revolution (2003), the Ukraine’s Orange Revolution (2004), the Iranian Green Movement of the post-2009 presidential election, and finally during the Arab Spring (2011-present). But a bulk of the population being under 25 years old in a given country does not necessarily lead to revolution. It’s when leaders of such countries deceive and fail their younger citizens through systematic corruption, for instance, that the risk of upheaval is much higher. A 2014 study by political scientists Natasha Neudorfer and Ulrike Theuerkauf, suggests the contrastability effects of corruption: The beneficiaries increase their income, while a larger portion of the population feels the inequality as economic growth and investment stagnate. This particularly affects the youth population, who are not yet inserted in the system and have fewer economic opportunities. Autocratic corrupt states also allocate a larger portion of their budget to military and security forces, under-spending on education and health. This situation might stimulate youth adherence to anti-establishment movements, including radical ones. According to Nigerian scholar Freedom C. Onuoha, political corruption is behind the formation and durability of terrorist groups in Iraq, Syria, and Nigeria. These groups succeeded in attracting the marginalized parts of the population that are mainly from the youth bulge. But corruption alone, like age, is not creating political unrest. A combination of the right amount of youth within the overall population suffering from corruption is necessary. A good example is Iran. The country experienced one of the most significant political changes of the 20th century, when the 1979 Islamic Revolution ended its monarchy and has been thriving on oil revenues since. Oil revenue-dependency was less than 1% of the total economy from 1970 to 1973. Substantial increase in oil prices from the mid-1970s led to a massive increase in the Iranian economy’s dependency on it— from 0.3% in 1973 to 31% in 1974, according to the World Bank. Based on my calculations of the World Bank’s Health Nutrition and Population Statistics, the share of 15 to 24-year-olds among the overall adult population has been higher than 20% from 1960-2016 (with an exception of 19% in 2016). For this time period, we observed a continuous increase in the youth bulge in Iran from 33% in 1970 to approximately 36% (one of the highest in Iran’s demographic history) in 1979 (World Bank Population Estimates and Projections, 2017). With oil income growing along with a diversity of activities linked to its production and circulation, corruption—for which we do not have data before 1985—has emerged as a way of life. In 1997-98, the share of Iranians aged between 15 and 24 in the adult population reached 36% (World Bank Population Estimates and Projections, 2017). At the same time, Iranian politics experienced a significant change with the presidential election of Mohammad Khatami, whose main support base was the youth. This did not lead to a revolution, but civil unrest has regularly affected political life, including in 2009. World Bank Population Estimates and Projections show that the share of youth in Iran will drop to 11% by 2050, reducing the political risk of demographics in the presence of corruption in the future. Using cases such as the Iranian one, we tried to understand how corruption and youth could lead to crisis. We also took into account other drivers of conflict such as inequality, economic growth, investment rate, inflation, government spending, military spending, oil rents, trade, education, fertility rate, and democracy. We controlled for specific differences between the countries we studied, such as geography, geopolitical situation, cultural and historical heritage, and religion. International attention and intervention of external powers were also taken into account. And we included events such as the 2008 global financial crisis and the 2003 Iraq war. Table 1 illustrates the marginal effect of corruption on internal stability at different levels of youth bulge. Click image to enlarge. 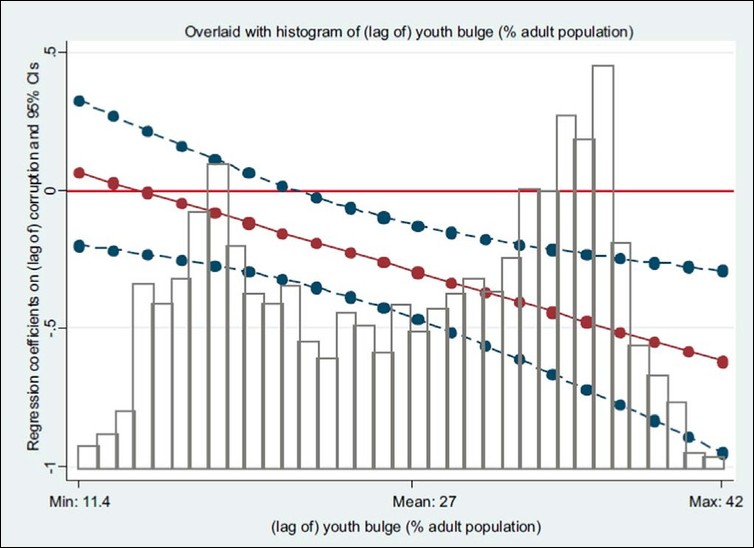 Figure 1 illustrates the marginal effect of corruption on internal stability at different levels of youth bulge. Click image to enlarge. Based on our main results, Table 1 and Figure 1 show average marginal effects of corruption on political stability at different levels of youth bulge. We are 90% confident that a youth bulge beyond 20% of adult population, on average, combined with high levels of corruption can significantly destabilize political systems within specific countries when other factors described above are also taken into account. We are 99% confident about a youth bulge beyond 30% levels. Our results can help explain the risk of internal conflict and the possible time window for it happening. They could guide policymakers and international organizations in allocating their anti-corruption budget better, taking into account the demographic structure of societies and the risk of political instability. Mohammad Reza Farzanegan is Professor of Economics of the Middle East, University of Marburg. This article was originally published on The Conversation.